Some books make the A List, and some books make the O List. In February, T.S. Poetry Press, known for poetry and memoirs, published its first novel, The Whipping Club by Deborah Henry. It is the story of a child placed for adoption, and years later, his birth parents learn that he wasn’t adopted as they had been told, but is in an orphanage – an institution that is more about child abuse than child care. The novel is about to get that audience. This week, O Magazine—O as in Oprah—published its list of the 29 hottest reads for the summer – and The Whipping Club is on the list. It made the O List. O my goodness. Here at TweetSpeak Poetry, we’re celebrating Deborah Henry’s book and its O-list recognition. Like the secrets buried in The Whipping Club, we’re burying some secret words – secret O words. Three different words will be available in our blog posts each day. For example, you might see #Oprah, and you might see #Ovation, and you might see #Onyx. Or three other O words. (Personally, I like the word #Oleander.) Look for the hashtag symbol (#) in front of an O word. Then write a poem or take a picture, using or illustrating the secret word. Post the poem or picture on your blog, Twitter, or Facebook, with a link back to this post. 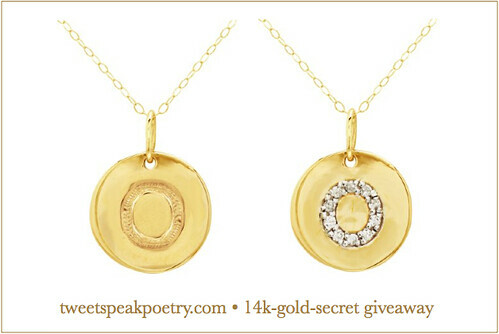 Then stop in and share your post link with us in this comment box, and you’ll be entered in the 14-k-gold-secret giveaway (one necklace—winner’s choice—from the options below). Multiple entries, each using a different secret word, are perfectly acceptable. The contest ends on Friday – this Friday, June 15, at 9 p.m. Eastern time. One winner will be picked at random and announced here at TweetSpeak on Monday, June 18. The more you share, the more chances you have to win! Just remember to link to us and to come back and share your post link with us HERE. Congratulations to Deborah Henry and T.S. Poetry Press. And start looking for those secret O words. Check out The Whipping Club, by Deborah Henry! Must poems use all three of the daily words, or can you use just one or two to be eligible? Alas, I don’t write poetry. But I’m downloading my copy as soon as I finish typing this comment. So very happy about all of this. Which sounds a lot like Oreos. Well didn’t you all have fun without me here this afternoon? You know, oodles of good words begin with the letter O. Like Owens. And Orangutan. Not that those two are related. In any case, We’ll see if I’m able to wax poetic. Or onomatopoeia-tic. Another good O-word, no? I’m just happy to have gotten the book for $2.99. Congrats to miss Deborah and TS Poetry Press. It only takes one person of influence to garner the attention of distracted bystanders. So happy Oprah noticed the book and shouted it to the masses. Yay! Wish I was a poet, I would join the party here. I’ll just linger in the creativity of others. My poem “Ovation.” What a fun way to spend the week. Thank you for inspiring me to play with words. So proud of you guys! BIG HUGE CONGRATULATIONS. This is worthy of shouting from the mountaintops. Or else, just quoting a celebratory poem. Either way, NICE! Great announcement, Glynn! Well done! Thanks, Leah. 🙂 Love that you wrote a poem! Oh, having fun with O words. I love rocks. Here’s my poem for today. I’ll go to link that you did show. Thank you. This has been such fun! Darn. I honestly cannot figure out how this contest works. I click “blog” and it takes me back to the home page, referencing a daily blog that I can’t seem access. Are we supposed to be using the words #Oprah, #Ovation, #Onyx, or #Oleander? I was making the assumption those were examples and that the “real” secret words would be found elsewhere, but where? I am #obscured, #out-of-it, and #overwrought! Can you #oblige? Seems you figured it out—that every morning post this week had the secret words. Love all the poems you offered up! Oprah, Ovation, Onyx, and Oleander were the words for that post (sneaky Glynn). This song, by Human League plays in my head every time I covet a new pair of shoes; Especially the last two verses. Shoes…My Obsession! I will collect you and capture you! if only we would take the time to look. a much more posh #outpost. said the doctor to the nurse. “Is she qualified for surgery? to a doctor’s office nearby. for a Hashtag flea’s loose ends. —we thought it was the end. as he believed his career to be. to see his worth, restore his press. Actually the challenge of the game is more interesting to me than jewelry. Here’s the link to the first one. Actually, I’m more interested in the game than winning the prize. post, can’t help but wait to go through much more of your blogs.